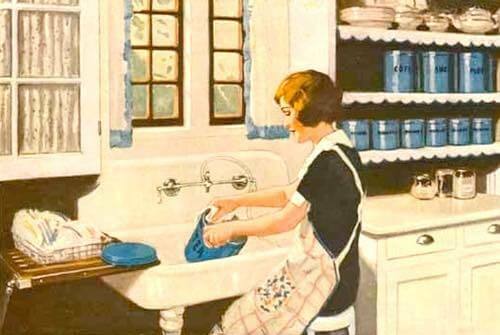 Here's Grandma's collection of old fashioned kitchen cleaning tips and tricks that were used by families to solve troublesome cleaning problems. Some tips are designed to make ordinary tasks, like dish washing and window cleaning a breeze. 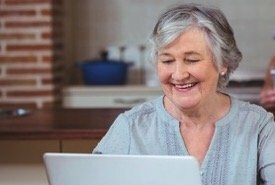 Whatever the cleaning problem, these imaginative solutions made Grandma's work easier. You're likely to find a tip that will help you too! Place a pitcher of cold water on a table in your room and it will absorb all the gasses with which the room is filled from the respiration of those eating or sleeping in the room. 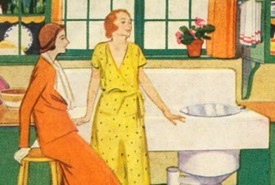 Very few realize how important such purification is for the health of the family, or, indeed, understand or realize that there can be any impurity in the rooms; yet in a few hours a pitcher or pail of cold water — the colder the more effective — will make the air of a room pure, but the water will be entirely unfit for use. Fill a dish with boiling water and drop in a piece of charcoal. To remove the odor of onions from saucepans in which they have been cooked, put sal soda [baking soda], fill with water, and let it stand on the stove until it boils; then wash in hot suds, and rinse well. Use a little ammonia in dishwater when washing glassware; it will make it sparkle like cut glass. Should be first rinsed in cold water before washing in hot water. Remove stain by rubbing with a little salt. Rub a fresh lemon thoroughly into soured sponge and rinse it several times in lukewarm water; it will become as sweet as when new. Gently wipe the picture, when necessary, in sweet milk and warm water, drying carefully. 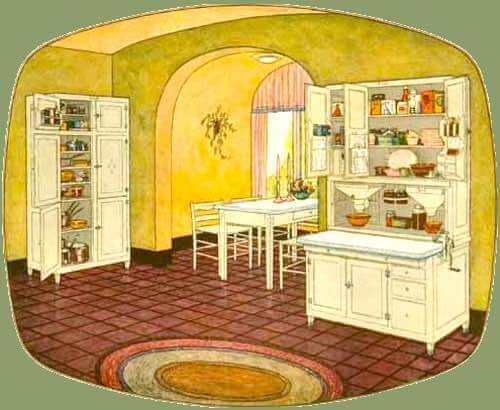 Cut into eight pieces a large loaf of bread two days old, blow dust off wall, rub down with a piece of the bread in half-yard strokes, beginning at the top of room, until upper part is cleaned, then go round again, repeating until all has been gone over. If done correctly, so that every spot is touched, the paper will look almost new. Dry corn meal may be used in place of bread, applying it with a cloth. 1 quart flour, 1-1/2 tablespoons powdered alum mixed dry, add cold water, let cook ten minutes, work on board, add a little flour if necessary. It should be like rubber. Take small bits and rub over paper surface. This handy kitchen cleaning tip for glass cleaning works even better if a small amount of white vinegar is added to the water. Divide a newspaper in two, fold up one half in a small square, wet it in cold water. Rub the glass first with the wet half of the paper, and dry it with the other. Using this simple window cleaning tip, fly specks and all other marks will disappear as if by magic. To remove varnish from glass use sal soda [baking soda]. A soft cloth wet in alcohol, is excellent to wipe off plate glass and mirrors, and prevents their becoming frosty in winter. Soapstone or sandstone hearths are cleaned by washing in pure water, then sprinkling with powdered marble or soapstone, and rubbing with a piece of the stone as large as a brick, and having at least one flat surface. Never wash the unsealed marble tops of wash stands, bureaus, etc., with soap. Use clean warm water (if very much soiled add a little ammonia) and a soft cloth drying immediately with a soft towel. There is nothing that will entirely remove grease spots from marble, hence, the necessity of avoiding them. To clean marble or marbleized slate mantles, use a soft sponge or chamois skin, dampened in clean warm water without soap, then polish with dry chamois skin. In dusting, use a feather duster, and never a cloth, as it is likely to scratch the polished surface. Are preferable to marble, as they are not so easily soiled. To wash them, use a clean cloth and warm water. Many oil them thoroughly when new with linseed oil; thus prepared they never show grease spots. Hang in the cellar way to keep soft and pliant. Dip them for a minute or two in a pot of boiling suds once a week and they will last much longer, making them tough and pliable. A carpet wears much longer swept with a broom cared for in this manner. Keep an old dish with sour milk and a cloth in it, wash the kettle with this, afterward washing off with clear water, and it will look bright and new. Instead of sour milk, you could try using buttermilk. When much discolored, put in a half pint of vinegar and a handful of salt, put on stove, let come to a boil, take cloth, wash thoroughly, and rinse out with water. If using every day, the salt and vinegar and rinsing are sufficient. Steel knives which are not in general use may be kept from rusting if they are dipped in a strong solution of soda: one part water to four of soda; then wipe dry, roll in a flannel and keep in a dry place. Cut a good-sized, solid, raw potato in two; dip the flat surface in powdered brick dust, and rub the knife blades. Stains and rust will disappear. Or rub up and down in the ground. An old cabinet maker says the best preparation for cleaning picture frames and restoring furniture, especially that somewhat marred or scratched, is a mixture of three parts linseed oil and one part spirits of turpentine. It not only covers the disfigured surface, but restores the wood to its natural color, and leaves a luster upon its surface. Put on with a woolen cloth, and when dry, rub with woolen. Hold a hot stove lid or iron over them and they will soon disappear. Wet the part in warm water; double a piece of brown paper five or six times, soak in warm water, and lay it on the place; apply on that a warm, but not hot, flat iron till the moisture is evaporated. If the bruise is not gone repeat the process. After two or three applications, the dent will be raised to the surface. If the bruise be small, merely soak it with warm water, and hold a red-hot iron near the surface keeping the surface continually wet; the bruise will soon disappear. Sweet milk added to the water with which oil cloth or linoleum is washed will make it luster like new. To clean oil cloth, rub with sweet milk. A dingy oil cloth may be brightened by washing it in clear water with a little borax dissolved in it; wipe it with a flannel cloth that you have dipped into milk and then wring as dry as possible. Cover spots with fine flour and then pin a thick paper over; repeat the process several times, each time brushing off the old flour into a dustpan and putting on fresh. 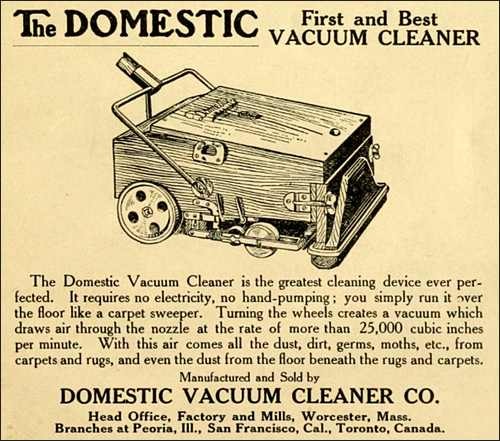 This old time kitchen cleaning tip for carpet cleaning can save you money. It works well when using a vacuum cleaner, and it saves you from having to buy carpet brightening powders. Carpets after the dust has been beaten out may be brightened by lightly scattering upon them corn meal mixed with salt and then sweeping it off. Mix salt and meal in equal proportions. Salt thrown on soot which has fallen on the carpet will prevent stains. If the hands are stained there is nothing that will remove the stains as well as lemon. Cut a lemon in halves and apply the cut surface as if it were soap. Rub ink spots with a match, then wash in soap. Salt and vinegar will remove tea stains from china. Add a tablespoon of ammonia to a basin of dishwater and it will not become greasy. Milk, sour or sweet, well rubbed in with an old, soft flannel, will make black walnut look new. To clean mica in a stove that has become blackened with smoke, carefully take it out, and thoroughly wash it with vinegar. If the black does not come off at once, let it soak a little. Gently scrub with a small brush and soapy water containing a little ammonia. When ivory ornaments become yellow or dusky, wash them well in soap and water with a small soft brush, to clean the carvings, and then place them, while wet, in the sunshine. Wet them with soapy water for two or three days, several times a day, still keeping them in the sunshine, then wash them again, and they will be perfectly white. Warm dusters make the polishing of furniture so much easier, and a more brilliant polish is acquired. Any dish that seems to require soaking until the next meal washes easily if placed upside down in a pan of hot water and steamed a few minutes. Steaming cleans dishes much quicker than soaking. Make a simple paste using flour, salt, and vinegar. Simply brush it on, let it sit for a while, then rinse it off with clear water. You can also use ordinary tomato catsup. It may require more than one application if the tarnish is severe. Cut some brown paper into very small bits, so as to go with ease into the decanters; then cut a few pieces of soap very small, and put some water, milk-warm, into the decanters, upon the soap and paper; put in also a little baking soda. By well working this about in the decanters it will take off the crust of the wine and give the glass a fine polish. Half fill with cold water, then cook in it one whole onion unpeeled until soft. When putting away those not in use every day, lay a little stick across the top under the cover or lid. This will allow fresh air to get in and prevent the mustiness of the contents, familiar to hotel and boardinghouse sufferers. 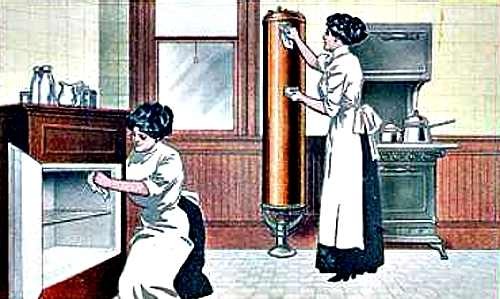 Heed this old time kitchen cleaning tip: Never allow suds or a particle of soap to touch old fashioned silver or plated ware! To clean silverware easily, save water in which potatoes have been boiled with a little salt, let it become sour, which it will do in a few days; heat and wash the articles with a woolen cloth, rinsing in pure water, dry and polish with chamois leather. Salt will remove the stain from silver caused by eggs, when applied dry with a soft cloth. When set away in a drawer or chest, silver keeps best wrapped in dark-blue tissue paper. An old linen tablecloth cut up in pieces of convenient size, hemmed, and marked "silver," is very handy. Use the old fashioned cleaning tips with "caution and common sense," and always "at your own risk." There is no guarantee these tips will work on today's synthetic materials and some methods might actually ruin them. You'll find simple, low-cost kitchen cleaning tips for cleaning items such as floors, wool carpets, mirrors, and marble fireplaces. There's even some old time silver cleaning tips. That's because cleaning and polishing silver plate was — and is — always a chore that takes time and much effort. It's never fun. I can remember helping Mom to polish her silver tea set whenever she needed it for a special occasion. It seemed to take hours. Eventually tiring of it, she wrapped her silverware in blue tissue paper (see the silver storing tip above) and packed it away in an old wooden storage trunk. Much later, my wife and I inherited her silverware and since we tend not to use it, it's still wrapped and protected in that old blue paper! If you enjoy using your silver plate, one of these old fashioned silver polishing tips might make the polishing chore a little easier for you and save some time. Anyway, it's worth a try. Desserts do look spectacular when served on a shiny silver tray. Have a look at this collection of kitchen cleaning tips for ideas on how to clean windows, how to brighten carpets, how to remove odors, or how to solve a puzzling cleaning problem that may involve old fashioned items or materials.